Several new materials have been added to the marketplace including: vehicle back-up cameras, zeosil fumed silica, plastic cap plugs, pallets, and more! 831 members are now on the Marketplace. The marketplace has helped divert more than 1740 tons (3,481,790 pounds) from the landfill! We plan on following up with older postings to determine if they are still accurate and available. The Ohio By-Product Synergy Network's next meeting will be on December 12, 2018 at Accurate IT in Columbus. Want to receive recognition for your environmental stewardship efforts, check out the Ohio EPA's Encouraging Environmental Excellence Program, now accepting applications. Read on for more details, and as always, thank you for being part of our program. If you have questions about your username or password, please email Travis.Limbert@epa.ohio.gov. Record any recycling or reuse transactions that occurred with the help of the marketplace here or email frank.basting@epa.ohio.gov with the details. Five hundred new vehicle back-up cameras with cable lengths from 15" to 21". They are NTSC Cameras with a sealed Molex connector 52266-0311. Currently asking for $1.00 per camera. Suggested Uses: Use for tow motor, fork lift or vehicle back-up camera or could be used as part of an art exhibit. 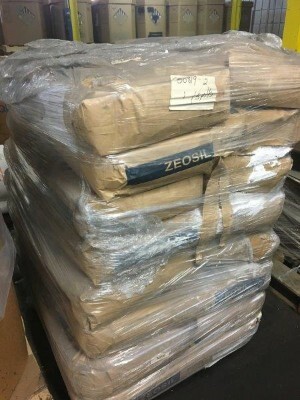 600 pounds of zeosil fumed silica bagged and on a pallet. Suggested Uses: Can be used as a desiccant, a light abrasive, as an additive for paints, inks, printer toner, adhesives, and resins to adjust viscosity and in cosmetics. New in the box plastic cap plugs. We have 30 boxes with 500 plugs/box for a total of 15000 caps. They are 2 1/2" diameter, 1" deep and orange in color. Believe the material is PET. Suggested Uses: The caps could be used for protecting areas in a painting process as either an insert or cover, could be used as cups or material for arts or could be recycled. Materials diverted from the landfill include plastic bottle caps (4.6 tons), wooden pallets (0.28 tons), E-waste (0.63 tons), plastic drums (7 tons), steel drums (3.75 tons), specialty vermiculite (25 tons), giant magnet (0.1 tons), carbon black (15 tons), spent lime (1624 tons), polypropylene cloth balls (15 tons), sawdust (14.2 tons), tarps (0.75 tons), two Siemens Carbon Filtration Units (30 tons) and shelving. Tip of the Month: Check out the latest postings. There are free items that may be of use to your business.